Little River South Carolina is our specialty. Our team is committed to making the buying and selling of condos in Little River, SC a pleasurable and rewarding experience. 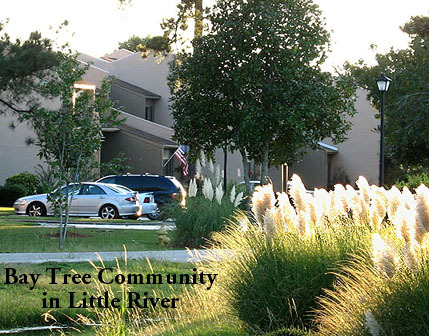 Our website allows you to search all active Little River condominiums for sale. It is easy to use and navigate through condo searches. You can also save searches and get daily email alerts of new listings as they become available. Little River is a very special little town, really a quaint fishing village, along South Carolina's greater Grand Strand. It's located 5 miles north of North Myrtle Beach, and 20 miles north of much-busier Myrtle Beach - outside of the higher taxes and traffic jams, but near enough to head south for the bright lights if the urge strikes. However, more than likely you are here to enjoy less of life's hustle-bustle and more of life's simple pleasures. That's what you will find in Little River, along with tasty fresh seafood, fishing boats and charters (operated by the same families for generations),a famous yearly Blue Crab Festival and those unique beauties of the South, the gorgeous ancient Live Oaks. A slower pace of life still exists here, but Little River does have its own way of generating excitement: Several Las-Vegas-style casino gambling boats now dock in town. Locals and tourists can get on board for world-class casino gambling excursions into international waters where gambling is legal. The smart money says try your luck in Little River. Every year in mid-May, the waterfront is the place to be for a carefree weekend surrounded by the people, music, food, and arts and crafts of the annual Blue Crab Festival. This is an event not to be missed! The rest of the year you can play golf, go boating, shop the quaint shops of Little River, rent jet-skis, nature-watch or go to the local winery. Fishing is an integral part of the life and times for many residents and a huge part of the history of Little River. Visitors are encouraged to book a fishing charter to catch a glimpse of the unique life and work of generations of fishermen from this small and special coastal enclave. Little River has grown in the last few decades to become a coveted, peaceful town in which to live. There are several new condo communities, complete with their own marinas and stores, and some of the best priced real estate in the area. This kind of peace, quiet, Southern Charm and maritime beauty, in close proximity to bigger city amenities, is a rare and special find. Life is good in Little River! Visit our Myrtle Beach golf blog for news about the Golf Capital of the World! Learn about Myrtle Beach golf courses, and all the fantastic Myrtle Beach Resorts that we offer with our packages. We have a Myrtle Beach Real Estate blog at ActiveRain.com, and even a website about Conway SC.